"By their fruits thou shall know them." (St. Mathew 7:16). 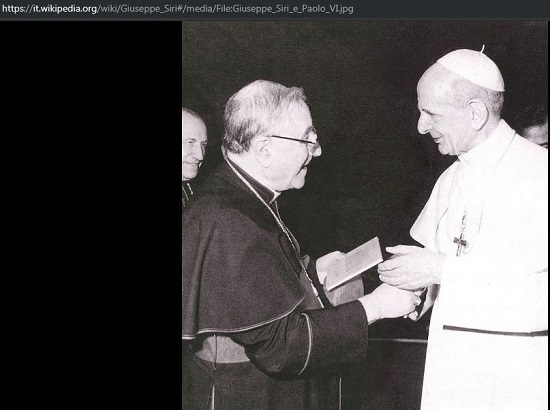 The propagators of the so-called "Siri Thesis” claims that Giuseppe Cardinal Siri was elected pope at the 1958 conclave to succeed Pope Pius XII. They pretend that Cardinal Siri never compromised with Novus Ordo. In fact far from being orthodox, since October 1958 till May1989, Siri was definitely a cardinal of the Vatican II church, not the Catholic Church. 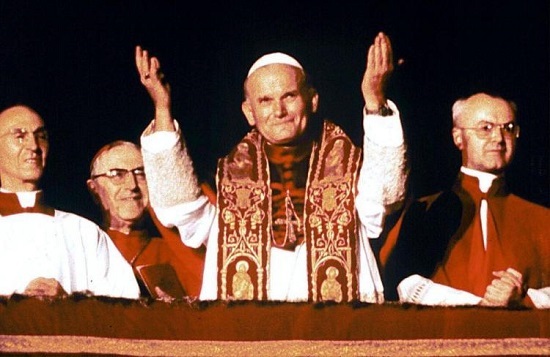 He accepted the authority of “John XXIII”, “Paul VI”, “John Paul I”, and “John Paul II”. His denials of the Faith are easily accessible via the Internet. 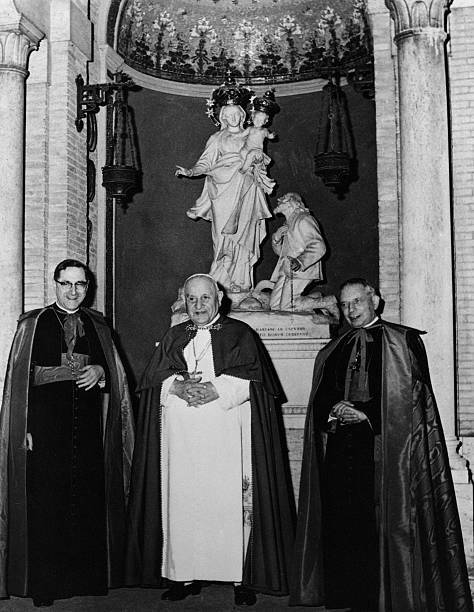 There are some photos showing how joyfully and amicably Cardinal Siri dealt with the Vatican II "popes" and saying the n.o. "mass" with “John Paul II” at an outdoor n.o. 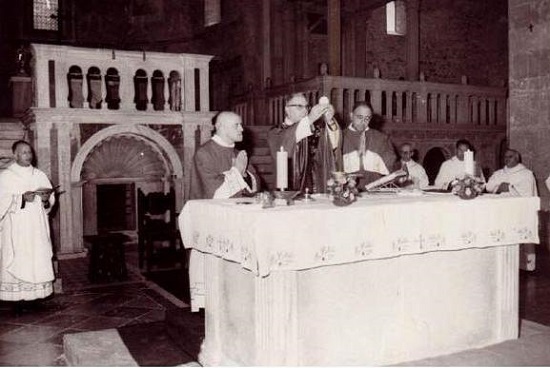 "mass" said in Genoa during the "papal" visit in 1985. No serious Catholic can consider these attitudes of Cardinal Siri as those of a prisoner kidnapped from his “pontificate” and deprived of it by force or some strong moral pressure. Instead, the photos show the public activities of the n.o. Archbishop of Genoa, accepting without any difficulty the Vatican II “popes” as his superiors. An excerpt from an article "Why Guiseppe Siri Was Never Pope" (See PS). "Whether Siri was elected or not, he violated his sworn oath to Pope Pius XII who made him cardinal. 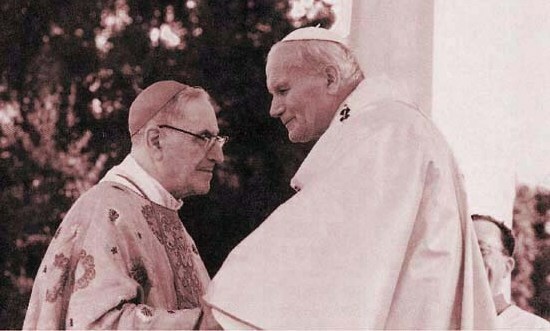 The oath reads: "For the praise of Almighty God and the honor of the Apostolic See, receive the red hat...By this you are to understand that you must show yourself fearless, even to the shedding of blood, in making our holy Faith respected, in securing peace for the Christian people and promoting the welfare of the Roman Church. In the name of the Father and of the Son and of the Holy Ghost. Amen." Whether during or after the Conclave Siri showed himself unworthy of the cardinalate he received. He also, then, would be a candidate considered unworthy for election to the papacy. Siri denied his loyalty to the Church of Pope Pius XII and declared his allegiance to the anti-Church in violating his oath. There can be no doubt that Pope Pius XII wished to bind Siri absolutely by this oath. Neither then is there any doubt that if he indeed was elected and chose to remain "hidden" in violating his oath, Siri grossly insulted and denied the "praise of Almighty God and the honor of the Apostolic See." This being the case, it would seem that he may have committed the most grievous act of treason possible against his own Church, and thereby forfeited his status as a member of that Church. In unquestionably recognizing Roncalli as pope in his public writings; in delivering Paul 6's funeral oration and pledging himself to fulfill this antipope's agenda, long after the destruction in the Church was painfully clear, Siri left no doubt that he embraced the heretical teachings of the false Vatican 2 council, the institution of the Novus Ordo Missae and the heretical changes in the rites of the Sacraments. 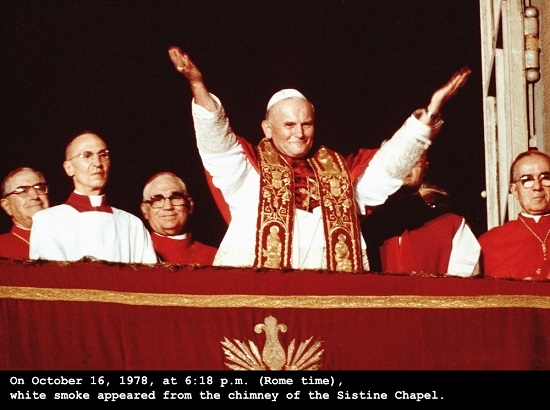 That a true Pope, bound to guard the flock against the very wolves that consumed it, could somehow consider his own life more precious than his lambs' is not only preposterous - it is contrary to Divine revelation." Yes, the public defection from the Catholic Faith by Cardinal Siri brought automatic loss of office. PS. It is seems that an author of the article was involved with electing so-called "Pope Michael", and now is a "home aloner". Of course, we do not support any of these groups. We only agree with some arguments of only one article about Guiseppe Cardinal Siri.